Flock Friends, share your coop for a chance to win $500, 480 pounds of feed & more in the Purina® Coopitecture™ Contest! 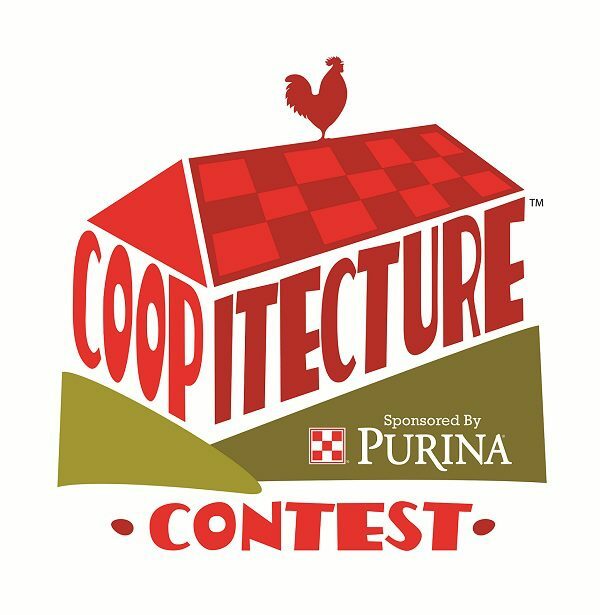 Purina’s Coopitecture™ Contest puts the coop in architecture by rewarding poultry owners for their careful planning, creative ingenious and days of hard work to build their girls’ coop. Just for entering, the first 500 participants will receive a FREE 40 pound bag of Purina® Layena® Plus Omega-3 poultry feed. Eligible entries will be posted on the Purina® Poultry Facebook page until 11:59:59 p.m. ET on April 22, 2013. The top 10 entries with the most votes per category will be judged by a panel of judges, including Purina Animal Nutrition LLC nutritionists. Five Grand Prize winners, one per category will receive a $500 cash value card, personalized collectible Purina® coop sign and twelve 40 pound bags of Purina® Layena Plus Omega-3 poultry feed. Ten First Place winners will receive twelve (12) free 40 pound bags of Purina® Layena Plus Omega-3 poultry feed and a personalized Purina® collectible sign. Thirty-five of the top 10 entries with the most votes per category not selected for the Grand Prize or First Place will receive a Purina® collectible sign and one (1) free 40 lb. bag of Purina® Layena Plus Omega-3 poultry feed. Submissions should consist of a photo or drawing of an original coop design (only your designs or one that resides on your own property) by uploading to www.facebook.com/PurinaPoultry before April 22, 2013. Participants are asked to pick which category best reflects their coop’s personality. Free-cycle/Recycle – Coops displaying elements that are re-used and/or good for the environment. Your Dream Coop –Extravagant coops that provide their chicken inhabitants nothing but the best. Smart/Functional – Coops that are dual-purpose, fill a specific, secondary need or created forsmaller budgets. Castle de’ Coop – Coops that are built for a queen designed with all the luxuries. Clever/Eccentric – Coops with those special extra elements no one is expecting. Winners will be announced on May 8, 2013 on the www.facebook.com/purinapoultry page. Hurry and enter your coop at www.facebook.com/purinapoultry or by visiting http://a.pgtb.me/9jDXXk and share with your friends to receive the most votes!